Where the f*** did all these people come from? When asked by the head instructor at the Midwest Center for Movement, Rigan Machado Brown Belt Mike Ellefson, to come in and ref for his bi-annual Grappling Games in Hudson, WI, I was looking forward to a good, kind of short, day of competition. 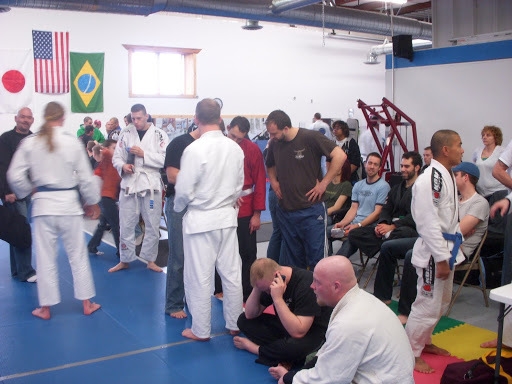 Traditionally, the Grappling Games has always brought out the competition regulars from gyms like MWCW, McCune's Martial Arts, Minnesota Top Team and other metro Minnesota schools. The pre-registration numbers were only 25, so I wasn't expected too long of a day. Even with double elimination I thought I would be done pretty quickly. At 8:15am, the line for registration was out the door. Nearly 100 competitors had shown up to roll. It would seem that word has spread that the Grappling Games may be one of the best smaller competitions around. Though, I don't know how much longer it could be considered "small". Also present and reffing was guest referee, World Champion Rigan Machado Black Belt Chris McCune. Using a combination of NAGA and IBBJF rules, the competition was double elimination, Gi-trumps. Meaning, that if only one of the competitors wants to wear a gi, both have to. This is Mike's way to stay traditional, but still be a little flexible just in case people want to do no gi. Also, you are guaranteed at least two matches. Never a bad thing. Especially for only $25 (pre-reg was $20 with a free t-shirt). On top of that, kids, teens and adults all had the option of rolling in an Absolute bracket for trophy prizes and more mat time. The teen absolute featured one of my favorite fights in which a 205 pound 14 year old had dominated everyone he went against, finishing all of them and not losing a point. In the finals he faced the smallest competitor, less than half his size. And he got his back taken. And he couldn't finish him. The true heart of BJJ. Size really doesn't matter. No matter what my wife says. I was also amazed by how many schools were represented at the competition. MWCM, McCune's Martial Arts, Spartan (about to be opened under Pedro Sauer black belt Tom Schmitz), Minnesota Top Team, Paul Pethushin Martial Arts, Doc's Gym, the normally competition-reclusive Warrior's Cove, Minnesota Martial Arts Academy and a few others that I regret forgetting about at this time. By 2:30pm (after starting at around 9:30am) we were still finishing up the adult brackets, having three mats constantly in use. And despite this, spirits were high. Competitors were friends off the mat and aggressive on the mat. The only injury sustained was a fluke occurrence of a back going out due to an awkward position. All-in-all one of the safest competitions around. Especially that the adults were allowed all submissions short of neck cranks, spinal attacks and twisting leg locks. The level of competition has increased each level as well. No moment was this clearer than in the adults Absolute division. 12 competitors from white to purple signed up for single elimination competition. Ben, Ryan and Melvin (in order from first to third) all white belts. Melvin having no wrestling background and only 4 months experience shown as the most promising young talent at a competition filled with excellent competition. The next time you see the Grappling Games posted on the site, please, give it notice. For price and level of competition, it may be the best event you will ever go to.